This function the Marquette fulfils admirably, and it is a very valuable edition to the Buick range. As we also explain in our article, this report of the road behaviour of the Marquette is rather different from our usual road test article, as the more extended nature of our trip enabled us to obtain a much better idea of the car’s capabilities over give-and-take roads. Business and pleasure were combined admirably, for the country visited is amongst the most attractive in the State. On saturday, 30th November, we journeyed to the Seven Mile Beach at Gerringong, South Coast, with two objects in view? 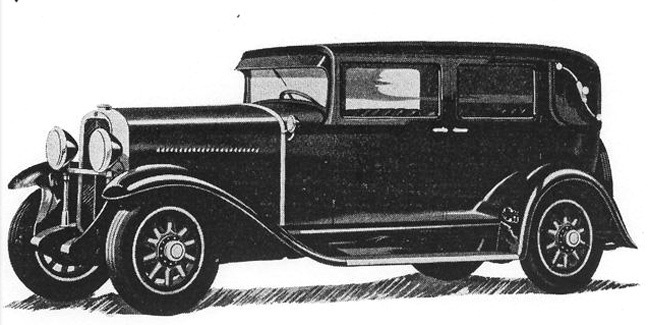 (a) to witness Mr Norman Smith’s attack on the Australasian mile record, and (b) to test the capabilities of the new Marquette, which, as most motorists know, is produced by the Buick factory and virtually takes the place of last season’s standard Buick, although at a somewhat lower price- A further consideration was a study of that particular route as a possible one for a somewhat lengthy one-day tour. Therefore, we set off fairly early in the Marquette, which had been lent to us by Boyd Edkins Limited, who are the Sydney distributors, not knowing how long the trip would take us, as our knowledge of the road conditions further than Bulli were somewhat hazy. As it turned out, we left Sydney at least an hour too early. A Brief Description of the Car. Before going further, some description of the car is called for. Put briefly , the Marquette is built on straight forward and conventional lines, having a side-valve engine of 3 1/8 inch bore and 4 5/8 inches stroke, developing 67 1/2 horse-power. The wheelbase of the car is 114 inches, and the chassis is set low and suspended on semi-elliptic springs with hydraulic shock absorbers as standard equipment. Four-wheel brakes of the internal expanding self-energising type are fitted, while the fuel is fed to the carburettor from the main tank at the rear by means of a fuel pump which has this advantage over the vacuum tank, that the engine can be kept pulling hard for long periods without fear of the carburettor starving. In appearance the car is undeniably handsome. The vehicle used by us was the four-door sedan of the type illustrated, and it will be noticed from this that the car presents a most compact but graceful appearance on the road. Its attractive radiator, with the herringbone-shaped slats at the front, covering the core, is a striking part of the whole ensemble. This particular vehicle costs ?440, but a touring model is available at ?365; a “Majestic” sedan at ?490, and five other models at prices varying from ?430 to ?505. However, to resume the account of our trip. We set out through St. Peters and over the George’s River bridge at Tom Ugly’s Point and followed the upper coast road as far as Bulli Pass. On the section from Tom Ugly’s Point to Bulli the car maintained a practically steady speed of between 45 and 50 m.p.h., occasionally touching 60 for short bursts, but so great is the reserve of power and so good is the roadholding ability ot the car, that this fast touring pace was maintained without the slightest difficulty, it being possible to hold the car rock steady and take it round easy bends at 50 m.p.h. by holding the wheel with the thumb and forefinger of one hand only. From the touring motorist’s point of view, apart from the pleasure of driving the car itself, this portion of the journey was disappointing, as lowering clouds soon started to shed rain, and for the few miles before reaching Bulli Pass, anything in the nature of scenery was obscured by a light but misty rain. As it happened, however, when we reached the top of the Pass the visibility was fairly good, but the marvellous view which is obtainable from the Bulli Pass look-out is too well known to need further reference here. One feature about the car was impressed upon us very strongly during the last mile or two before we descended the Pass. This section of the road is very badly corrugated indeed, and a light car, or one that is badly sprung, receives a very severe buffeting from it. It is a fact, however, that, although we could hear the pounding of the Marquette’s tyres on its surface, not a shock was received by the occupants?and that at 40 m.p.h.! The springing of the Marquette is really extraordinarily good. Once Bulli Pass has been descended, a good tarred road surface faces one, and continues for some miles, and high speed is the order of the day. As a matter of fact, from the end of the Pass to Kiama the road is in almost perfect condition throughout if one follows the right one, but we managed to run off this road inadvertently and went through Jamberoo and took a circuitous route which eventually brought us to Kiama, but over many pot-holes and stony surfaces. This we had to put up with for miles, and, as the bad road surlace was accompanied by some sharp corners and steep pinches, our average speed suffered, and great was our surprise to find, when we arrived at Kiama eventually, that our journey from town for the 83 miles had occupied only 2 1/2 hours. No better idea of the capabilities of the Marquette can be given than this. We were not after records, but at the same time were not dawdling. Fairly high speeds were maintained on good stretches of road, but the car was treated kindly on the “rough stuff”; yet, even so, without any effort at all, an average speed of over 32 m.p.h. was maintained. We had expected the trip to occupy three hours at least. than 80 or 90 m.p.h. On our return journey we followed the road from Kiama along the river’s bank, through Shellharbour and Kembia Grange, and on these perfect tarred road surfaces took the opportunity of obtaining some accurate figures of the car’s actual performance. With the stop-watch we found that it would accelerate from 10 to 30 m.p.h. in top gear in 8 seconds, and did the same thing in second gear in 4 4/5th seconds. Excellent times, both of these. We also discovered that the car has a maximum speed in second gear of no less than 51 m.p.h., and some miles further along the road, that in top gear it can be pressed to maximum of 74 m.p.h. Of its type, therefore, it can be seen that the Marquette has a performance that is exceptionally good. Its speed capabilities, by the way, are coupled with a top-gear pulling ability that is out of the ordinary. On our journey up Bulli Pass, second gear was brought into action only twice for short distances, and we have no doubt that if the car were tuned with very great care and a “crack” driver placed at the wheel, the car would cover this notorious gradient in top gear. That was the only occasion on which we found second gear necessary throughout the entire journey of nearly 200 miles. It might also be mentioned that a light and accurate steering gear is fitted and the brakes are smooth and powerful. Summing up, on the completion of the trip we were satisfied that the Kiama district, with its beautiful scenery and, for the most part, good roads, makes an excellent one-day tour from Sydney. We also finished the trip with a very great respect and admiration for the Marquette. As a touring car of moderate price, with an exceptionally good performance, in our opinion it has very few equals.